Can both parents keep working after twins? The short answer is yes, they can. If you both really want to, you can make it happen. The long answer hinges on several factors: lifestyle, child care, and work effectiveness. Seriously consider these questions and discuss them with your spouse. What do you want your family’s lifestyle to be like after the twins are born? Do you want a parent to be home with the babies? Do you both have to work to pay the bills? Or do you both work to maintain a certain lifestyle? What would you cut back on or sacrifice in your current lifestyle if you only had one income? How do you feel about others caring for and raising your children? How much will child care cost you? Is the second spouse’s income mostly going toward that expense? Can one parent take off at least a year or so to care for the twins? Even if you have childcare during the day, you will still have to take care of the twins at night. During the first year, this nighttime care alone will cause a significant amount of sleep deprivation and wear you down. This will dramatically impact your effectiveness at work. When you are tired, you can’t think straight and will not be able to perform to the standard you did before twins. Consider the demands of both of your jobs to see how accommodating they are to any potentially reduced performance. Is it realistic to have two sleep-deprived parents working below acceptable levels? If that is too risky, let one parent work and help that individual get decent sleep so they can keep the job and perform as needed to support the family. If the costs of daycare are prohibitive (which they usually are), many twin parents will try and have alternating work schedules so at least one parent is always home with the twins. All of the above options require sacrifice and some creativity. Discuss the possibilities with your partner and your employer to see how you can adapt your schedule to meet your family’s needs. You have to figure out what is most important to you. Lifestyle? Money? 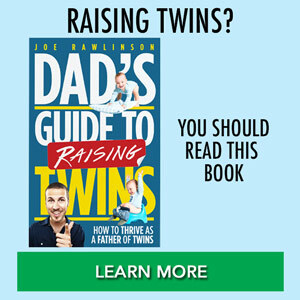 Raising your twins yourselves? Work? Often, just the thought of twins causes dollar signs to flash before your eyes. Everyone knows that one baby isn’t cheap; two seems exponentially more overwhelming. You both may feel that two incomes are needed just to provide for your new offspring. This may or may not be the case, depending on your priorities. Twins require a sacrifice of almost everything you currently take for granted, income included. However, the first year with twins is a blur and you can’t assume that life will be just like it was before the twins were born. Consider your situation from all angles before you make a united decision. Unity is ultimately what will make whatever you decide work. I personally like your website. It is easy to maneuver around. Everything is clear and concise. I really appreciate that I’m not bombarded with pop-ups and advertisements like most other sites. I especially like the links for the products you recommend…these save me a great deal of time in hunting for prices. I really enjoy reading through your experience and tips. Thanks for taking the time to share your wisdom with the rest of us! @Lauren – You’re welcome! I’m glad my site has been helpful to you. I just discovered this site, and thank you so much for it. My wife and I have twins that are just now turning three months old, and my wife will be returning to work next week. She is having second thoughts about it, but with two car notes and school loans there does not seem to be any other way. I’m wondering if y’all have any ideas. @Michael – family finances are definitely a challenge. Consider what is most important to your family right now. If it having your wife spend time with the kids, then you’ll need to cut your expenses to match your income. This will require tough cuts and sacrifice but the ability to have Mom home with the kids is invaluable. Perhaps your wife could work from home or in the evenings such that one of you is always home with the twins. Good luck! Just glad I found your site. Will be buying the book too soon. My wife and I are first time older (45) parents. Just found out we are having 2 fraternal twins through an embryo donation program here in Calgary AB Canada. Terrified but excited. Just not sure what to expect from anything. We are established so need nothing new but baby stuff. Costco here we come! @Bill – congratulations on your upcoming twins! My book will help you get ready and know what to expect. You will be exhausted but being a father of twins is amazing. We love Costco too!